If I had to sum up the Emperor’s Edge books, that would do it. I will admit I wasn’t sucked in on the very first page, but a few pages past that I was hooked. 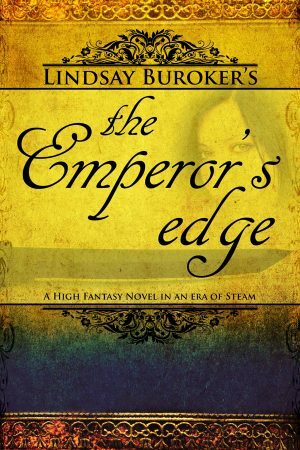 A friend of mine recommended The Emperor’s Edge (probably years ago) and I just hadn’t picked it up yet. Not too long ago I saw the first three books in an omnibus for 99 cents and decided to get it. I mean, for that price I wasn’t even worried if I ended up not liking it. Turns out I love it! I read the first three in less than a week. The third one (Deadly Games) I even stayed up late to finish although work would be waiting the next morning. I was so hyped up, strictly from the story, that I could not sleep until I finished it. I had to know what happened. Buroker has a gift for witty dialogue, often making me laugh out loud. The team she has put together in her novels works well, and allows each character to shine. Everyone has a distinct personality and gets fair page time. She doesn’t linger too long on one set of characters before checking in with the others, and the team is never split up longer than they need to be. These stories have stayed with me as well. I’m a pretty avid reader, and honestly I don’t remember all of the books I’ve read. With these books and characters, I want to visit again. I’ve even dreamed about them! And now that I’ve finished all the books and short stories in the Emperor’s Edge series, I’m going to read her box set called The Forgotten Ages, which takes place about 20 years earlier and explores a couple of characters we meet later in the Emperor’s Edge series. Plus a young assassin apparently makes an appearance. 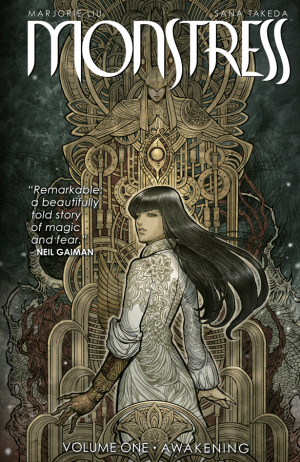 If you like fantasy and adventure, go for it! Highly recommended! I was so excited to receive an ARC from NetGalley! I’m a fan of Sullivan’s work, and first started with his Riyria Revelations series. From there I read the Riyria Chronicles as well. So maybe I was a little biased going into this, based on how much I’ve enjoyed his past work. When the new series was announced I was very eager. 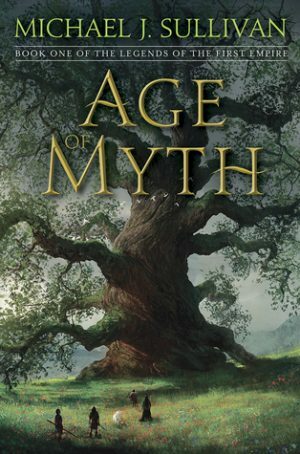 And the first installment, Age of Myth, did not disappoint. In the Legends of the First Empire Sullivan is expanding the world that readers have come to know through Riyria by taking us back in time so we can learn some of the history as to how this world developed. Age of Myth is the start of that history, where we see fundamental beliefs challenged. Humans are learning that elves aren’t gods, and the elves are learning that humans aren’t animals. If you haven’t read any of Sullivan’s previous work, that’s not an issue. You can pick this one up and dive right in. There are some throwbacks that readers will pick up on. A few things they’ll recognize from the Riyria novels. However, I think it would be just as interesting to read the Legends of the First Empire first, and then follow up with Riyria. Age of Myth is well paced. I was always eager to read more, and did not get bored with any section. Sullivan has a way of writing a large cast of characters, where each character has their own history. Sometimes with larger casts some of the characters can come off as two-dimensional. Not here. Even Grin the Brown has a history that’s woven into the story, making her feel every bit a full fledged character. And she’s a bear. I can’t wait for the story to continue in the second novel! For decades, Thorn has reigned as the most powerful demon in Atlanta, lurking in the spirit realm, whispering lies to unsuspecting human ears, commanding all other demons to do his bidding. But when Marcus, an old demonic rival, returns from exile to attack Thorn unexpectedly, Thorn finds his power ripped from his grasp. Wounded, desperate, and abandoned by his allies, Thorn is forced to ask himself questions—forbidden questions about demonkind’s place in the universe. Questions that threaten to undermine everything Thorn and his fellow demons have believed for millennia. With enemies closing in from all sides, Thorn grows ever more desperate for a way to escape his vicious life and to keep the people he loves safe in the process. But Thorn is a vile, wicked demon who has committed unspeakably evil acts. He could never truly love someone. He could never become good. I didn’t make it very far into this book, let alone finishing it. That being said, let me try to explain why I felt this book wasn’t the right choice for me. 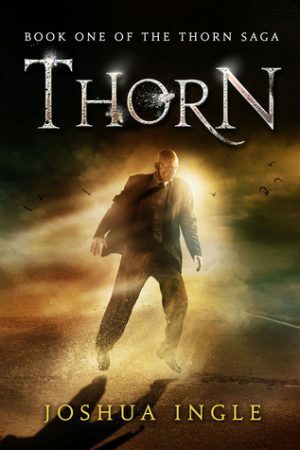 Thorn is the story of a demon, and demons generally veer toward the bad side of things. In this book, the demons’ purpose is to push negative thoughts on people and encourage those thoughts to grow and fester. In the short bit that I read, Thorn talked about a murder-suicide he was working to make happen, and how he couldn’t get a different person to commit suicide yet. The world is filled with enough news stories that are sad and depressing. That is not what I want out of a story I’m reading for an escape. Although the cover copy indicates that Thorn may become good, there was no hint of that in what I read. I didn’t see any evidence that Thorn was going to be different from the other demons or have some redeeming qualities. This is probably a case of giving up too soon, but there are so many books that I want to read that I’m not going to force myself to read something if it’s just not working for me. Every time I thought of picking this back up, I rejected it because I didn’t want to read about someone being belittled, or hurt, or told that they’re unattractive or not good enough. The negative beginning may be needed for the book to pay off later if Thorn undergoes a transformation, but it was enough that I found it off putting. Although the subject of the writing didn’t work for me, the writing itself was well done and I enjoyed some of the images the descriptions evoked. I found the demons themselves interesting, especially how they were not corporeal beings. Rather than interacting with the landscape and tangential items, they could float their body where they wanted it to be. However, they were corporeal to each other, as Thorn is able to be beaten. This is an interesting choice, and I liked that it wasn’t just a case of a demon inhabiting a body in order to roam the earth. Although I decided not to finish this story, I encourage anyone to check it out if the darker tone would not bother you.